Some 150 years apart, both composers developed minute nuclei into an ever expanding cosmos of sound, each against the background of his own era. Prick up your ears – Schubert's Fantasy in F minor and Sonata in B flat major D 617 crossed with Ligeti's Three pieces for two pianos: rich in contrasts, upsetting, and in a simply stunning interpretation by Andreas Grau & Götz Schumacher. 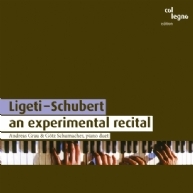 In the beginning there was simply the idea of playing Schubert and Ligeti together in one program: "During the performance, the music changes smoothly from Ligeti to Schubert, i.e. a 60-minute continuum of music is created, without interruptions even by applause." Grau and Schumacher are fascinated not only by the "relationship between tradition and the present" but also by other qualities that Schubert and Ligeti have in common, such as the "widely stretched linear developments," or the moments in which the music reaches extreme ranges or comes to a standstill, or sudden breaks occur. "The combination of avant-garde and classical repertoire sharpens the listener's ears." (Andreas Grau) It is this unrestricted attitude to music that makes recordings by Grau/Schumacher such a unique experience.